Finnish designer Tuukka Halonen has designed a range of pendant lights made of repeated interlocking parts for design brand Skandium. 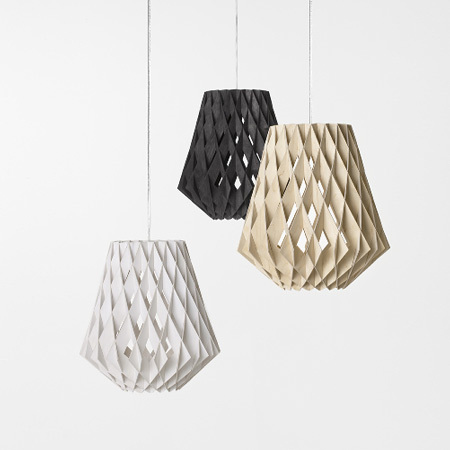 Called Pilke, the light shades are made of identical plywood cutouts, which interlock to form a three-dimensional shape. The shades slot together and don't require any tools or adhesives to assemble. The collection includes two different designs that come in white, black or beige. Skandium launches PILKE from Showroom Finland, designed by Industrial designer Tuukka Halonen. PILKE pendant lamps are entirely made in Finland and assembled by local craftsmen. The Shades are constructed of identical interlocking parts, no tools are required on assembly. The Lights are suited for energy saving light bulbs only. The material is ply birchwood and they come in two sizes - 36cm and 60cm.